As an herb, garlic has been used by mankind for thousands of years. Thought of by most people as primarily a flavoring agent, garlic actually does have some nutritional value as well. According to the World's Healthiest Foods website, garlic serves as a "very good" source of both vitamins C and B6, and also provides trace amounts of several other essential vitamins. According to the Linus Pauling Institute, vitamin C is important for the construction and maintenance of cell walls, especially the skin, connective tissues, bones, gums and teeth. Vitamin C also acts as an antioxidant within the body, helping to reduce the levels of harmful chemical agents called free radicals. Self Nutrition Data indicates that 3 cloves of garlic provide around 5 percent of the daily required intake of vitamin C.
Self Nutrition Data also indicates that the same 3 cloves of garlic deliver around 6 percent of the pyridoxine, also called vitamin B6, required per day by the average adult. This nutrient helps with the proper function of the nervous system, red blood cell formation, hormone activity and nucleic acid production, according to the University of Maryland Medical Center. Garlic also contains lower amounts of other vitamins. These include 1 percent of the daily requirement of thiamin, also called vitamin B1; thiamin, known as vitamin B2; and pantothenic acid. 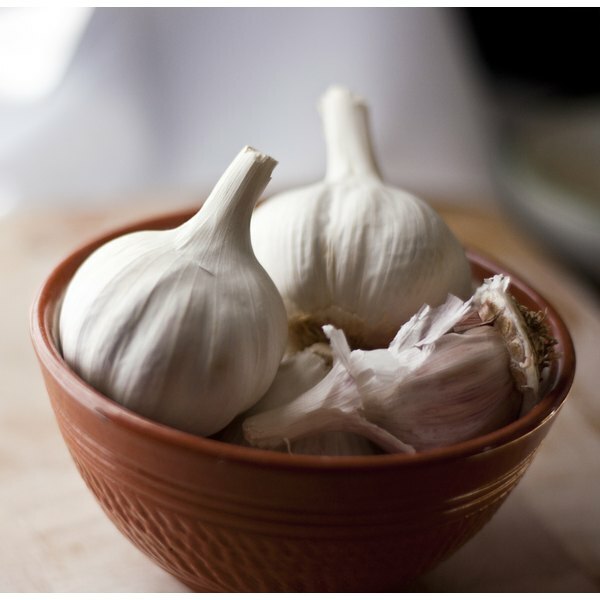 Trace amounts of vitamins E and K, riboflavin and folic acid are also available in garlic.